Look at this good looking group of people! great to see everyone who made it to our workshop on Tuesday night. We hi-lighted some strategies everyone can do at home or at work to keep their shoulders healthy and happy. We went through some basic, but powerful movements starting from the neck out to the hands. Join us on Tuesday April 9 at 6:30 pm for our Shoulder Rehab Mobility Workshop. Dr. Karo will be going over how our shoulders work and what you can do to decrease your risk of injuries and rehab injuries you may already have experienced. Space is limited for this interactive workshop, so RSVP today to save your spot. You have been registered to the Platinum Shoulder Rehab Workshop. See you on Tuesday April 9 at 6:30 pm. Ready for Day 17? We are moving on to Hip Mobility! Accumulate 8 minutes each side throughout the day. Check out this video from Dr. Karo. He has a movement that great for you hip and you can even do while sitting at work! Unfortunately, most of us aren’t living in a society that innately supports lifestyles required for daily survival, i.e. walking to get water. The positive side of living in this day and age is we now have a clearer understanding of what is necessary to stay healthy. The short of it is, our genes require movement, and we have modern practices that can fulfill these requirements. Mobility: Moving our joints in all available ranges of motion as done during practices of stretching and Yoga. Cardiorespiratory: Elevation of your heart rate through movement and exercise for an absolute minimum of 30 min. Muscle Loading: Using our muscles to complete tasks such as carrying, climbing, and hunting. If you do not hunt or climb daily, this requirement can be fulfilled through body weight movements or external objects such as weights. High Intensity Activity: Performing intervals of burst exercises such as a 1-3 repetition maximum weight lift, intervals of 100 meter sprints, or about 12 seconds of maximal exertion. Additionally we must perform a sub-maximal exertion for a moderate duration, such as intervals of 200-400 meter sprints. At Platinum Chiropractic our goal is to provide each of our practice members with the best in Neuro-Structural care as well as the latest in health science information. When we improve the alignment and motion of the spine, we are adjusting your body and allowing it to regain its genetic requirement for movement and exercise. This is why moving well is one of our principles of health. Platinum Chiropractic, Chiropractic Care, Chiropractic, Chiropractor, Chiropractor Cupertino, Cupertino Chiropractor, San Jose Chiropractor, Chiropractor San Jose, Chiropractor Santa Clara, Neurostructural Correction, Neuro Structural Correction, Neuro Structural Shifts, Eat Well Think Well Move Well, Self Care, Motion Is Lotion, Santa Clara Chiropractor, Chiropractor Sunnyvale, Mwod, Health Challenge, Platinum Family, Platinum Health Challenge, Platinum Challenge, Neuro Structural Chiropractic, Move Well, Movement, movement deficiency, movement deficiency syndrome, Dr. James Chestnut, Dr. Chestnut, How much should I workout?, How often should I workout? Now that our hips are all feeling great from yesterday’s challenge, it is time to give our shoulders some love. Day 10 is Shoulder Mobility! Check out this video from Dr. Karo showing some flexion and extension mobility for your shoulders. Accumulate 10 minutes throughout the day. Raffles include prizes from WholeFoods, ButcherBox, Beautycounter, Squatty Potty, and more! To qualify for the raffles, post evidence of you and/or your family and friends completing the Challenge of the Day on social media. This could be a photo or text on facebook, instagram, or twitter, sharing the original Challenge of the Day post, or commenting on the blog post. Don't have Social Media? Talk to Kristen about how to qualify. Be sure to include the #platinumhealthchallenge so we can find you! To qualify for the Weekly Raffle Drawing, complete 5/7 challenges for the week (Sun - Sat). To qualify for the Grand Prize Raffle complete 13/21 challenges throughout the month. Ready for Day 9? Sit in that squat! We all used to be able to do it… You may not be able to remember it, but before a baby can walk, it can sit in a squat. That includes you. Keep your feet flat on the ground and find a relaxed resting squat position as low as you can. If you need a little assistance, you can elevate your heels by an inch or two using a book, ledge, or curb to make it easier on your hips. You can also hold on to something in front of you like a door frame or post if you feel you’re falling backwards. We find the best way to approach a challenge like this is to pick a trigger and do the task every time you walk by that trigger. For example, say your trigger is the kitchen sink. Every time you walk by the kitchen sink, hang out in a resting squat for 30 seconds. You will accumulate 8 minutes in no time! This could be a photo or text on facebook, instagram, or twitter, sharing the original Challenge of the Day post, or commenting on the blog post. Don't have Social Media? Talk to Kristen about how to qualify. For Day 3 it’s time for everyone’s favorite…. Spinal Mobility! Accumulate at least 6 minutes throughout the day. Does that sound like a lot to you? Check out this video for some inspiration. Try out each of these movements for 2 minutes each and you’ll have completed the challenge. Easy Peasy! To qualify to win the raffles, post evidence of you and/or your family and friends completing the Challenge of the Day on social media. RSVP for the Head to Toe Spinal Show below. This will be an interactive mobility class featuring exercises and movements to help you heal faster, need less care, and see better results in both the short and long term. Start 2019 off on the right foot by joining us for the Head to Toe Spinal Show, an interactive mobility based workshop. The doctor will be going over corrective exercises that rehabilitate your body, keep your joints healthy, and improve your mobility. Reserve your spot today… space is limited. Friends and Family are always welcome. Come learn how to reinforce your Neuro-Structural care with corrective exercises that rehabilitate your body, keep your joints healthy and improve mobility. Tuesday January 15th at our Santa Clara practice location. Thank your for making 2018 an unforgettable year. We are grateful for the opportunity to continue to serve you in 2019. Let's start the new year off in the right direction with a movement workshop. The Head to Toe Spinal Show will feature exercises and movements to help you heal faster, need less care, and see better results in both the short and long term. Come learn how to reinforce your Neuro-Structural care with corrective exercises that rehabilitate your body, keep your joints healthy and improve mobility. Tuesday Jan 15 @ 6:30 pm. Friends and family are welcome. RSVP via the form below. Thank you! You will receive a confirmation email from info@platinumchiroca.com shortly. See you on the 15th! Here is an excerpt from last Tuesday's "It's All In The Hips" mobility workshop. Here, Dr. Karo discusses the biomechanics of your hips and how your hips and pelvis relate to your lower back. For more, stay tuned to our social media channels. Do you sit all day every day? If you're like most people then you probably sit for an average of 11 hours per day. Do you wonder why your back hurts? One of the causes can be improper tensioning your hips. Since your hips are directly tied in to your lower back, there are a few mobility stretches that can help alleviate this issue and help you restore your flexibility. Come join us for this hip mobility class to learn more. RSVP today, space is limited. Friends and family welcome for our Mobility Class: Move Your Spine Workshop. Tomorrow is the day! For August's workshop Dr. Karo will be focusing on joint health, in particular your spine, because who doesn't want to prevent spinal degeneration! Come learn how to manage the daily wear and tear on our joints as well as strategies for long term joint health. Sign up with via the form below. Friends and family are welcome. but we only have a few spots left. NTERESTED IN LEARNING MORE ABOUT KEEP YOUR JOINTS (AND ESPECIALLY YOUR SPINE) HEALTHY? COME TO OUR WORKSHOP ON AUGUST 14... MOVE YOUR SPINE. DR. KARO WILL BE LEADING A MOBILITY CLASS FULL STRATEGIES TO MAXIMIZE YOUR NEURO-STRUCUTRAL CHIROPRACTIC CARE FOR BOTH THE SHORT AND LONG TERM. For August's Workshop we will be having Mobility Class lead by Dr. Karo at the practice. This class' focus... Move your Spine. Come learn how to manage the daily wear and tear on our joints as well as strategies for long term joint health... because who doesn't want to prevent spinal degeneration! RSVP today because space is limited! Interested in learning more about keep your joints (and especially your spine) healthy? Come to our workshop on August 14... Move Your Spine. Dr. Karo will be leading a mobility class full strategies to maximize your Neuro-Strucutral chiropractic care for both the short and long term. While there are several different types of joints in the body, they all require the same factors to stay healthy. Our joints are special because, unlike most other parts of our body, there is almost no blood supply feeding directly into them. This is relevant because blood is our body’s way of nourishing itself and removing waste. So for joints, this means there is no pump (the heart) to move blood in and out. Instead, joints rely on internal bio-mechanics (movement) to pump fluids and nutrients in and out of each joint. This is why the most important factors for joint health are proper alignment, daily full range movement, and nutrients. For each of us this means we need to make sure we move our joints everyday. One of the key benefits of chiropractic care is the resulting improvement in joint biomechanics of your spine, which creates healthier joint cells. Interested in learning more about keep your joints (and especially your spine) healthy? Come to our workshop on August 14... Move Your Spine. Dr. Karo will be leading a mobility class full of strategies for how to manage the daily wear and tear on our joints and how to keep your joints and spine healthy over the long term. Our monthly workshops are held at our practice in Santa Clara and are designed to help you get the most from your Neuro-Structural Care. Friends and family are always welcome! Thank you to everyone who joined us for the Head to Toe Spinal Show this past Thursday. Check our Instagram and Facebook for some excerpts from the event. Our monthly workshops are designed to help you get the most from your Neuro-Structural Care. Friends and family are always welcome! In June, we will be screening a short film called "Death & Diabetes in the City of Angles", followed by a conversation with the director of the documentary Jay Vera. This is an event you won't want to miss. We will explore ways to decrease your risk of injuries which cause back pain, neck pain, disc herniations, arthritis, and sciatica, just to name a few. 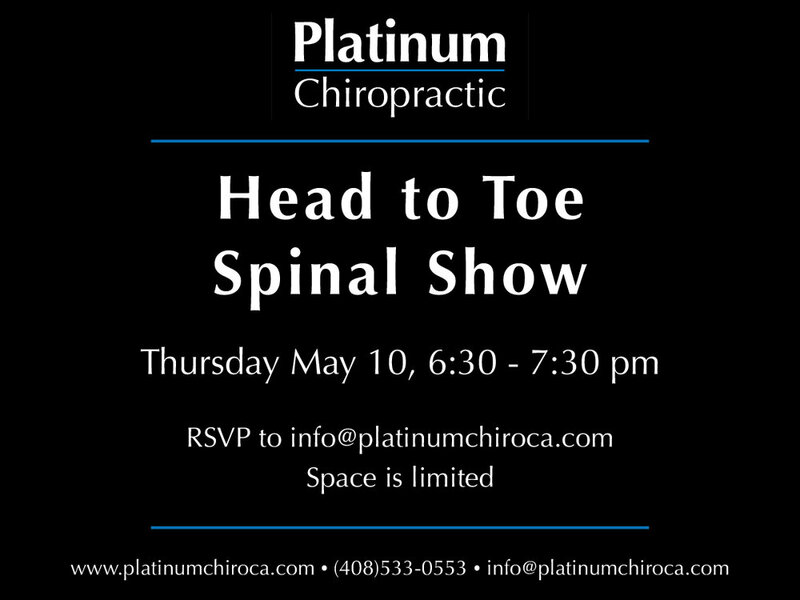 May's workshop is the "Head to Toe Spinal Show" and will be on the 2nd THURSDAY May 10th. Dr. Karo will be going over how our bodies are designed and meant to work. We will explore ways to decrease your risk of injuries which cause back pain, neck pain, disc herniations, arthritis, and sciatica, just to name a few. Learn how to move correctly and rehabilitate your body, keep your joints healthy and improve mobility. This interactive workshop will go over common areas of pain/ tension and actions you can take. Light refreshments will be provided. Space is limited so be sure to RSVP. Want to make progress with your mobility? 2 minutes each position, 5 times a day will get you results! It's all in the hips! Day 18 we are Mobilizing our Hips for 10 minutes! Check out our Instagram for some hip mobility exercises to spend some time on today (actually every day)! Take a look at this video from Dr. Karo on some shoulder mobilizing moves. For Day 12 of the Patient Appreciation Challenge we are showing our shoulders some TLC: Mobilize shoulders for 10 minutes. Check out our Instagram and Facebook Page for tips on your shoulder mobility exercises. You can break this up into sets through the day. Mobility Class this Tuesday January 9th at our Santa Clara practice location. For January's 2nd Tuesday Workshop we will be having Mobility Class lead by Dr. Karo at the new practice location in Santa Clara, CA. Learn how to move correctly, rehabilitate your body, keep your joints healthy, and improve mobility. Bring a friend and come mobilize! But don't forget to RSVP to save your spot. Space is limited. Thank you for registering. Kristen will reply to you shortly. Join us this Saturday November 11 at NCFit Steven's Creek Blvd. for Dr. Karo's Mobility for Olympic Lifting event. RSVP to reserve your spot.